Foodie Fun - Red sampling the "Dagwood" at Blondie's in Toon Town at Islands of Adventures Universal Studios Orlando. Dagwood Sandwich - It is a multi-layered sandwich with a variety of fillings. Used to denote a sandwich put together so as to attain such a tremendous size and infinite variety of contents as to stun the imagination, sight, and stomach of all but the original maker. Dagwood sandwiches, a term so well-known it made Webster's New World Dictionary. 1930 - A term that originated in the comic strips in the 1930s after a comic strip character named Dagwood Bumstead, a character in the "Blondie" comic strip. According to the creator of the comic strip, Murat Bernard “Chic” Young (1901-1973), the only thing that Dagwood could prepare in the kitchen was a mountainous pile of dissimilar leftovers precariously arranged between two slices of bread. 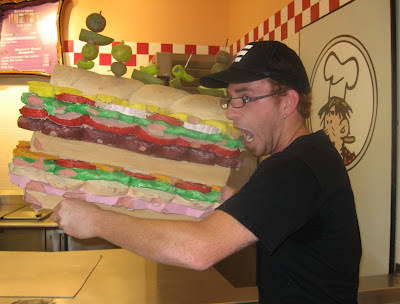 Dagwood became know for his huge sandwiches he created on evening forays to the refrigerator. The comic strip is produced today under the direction of the creator's son, Dean Young, the strip has continued to keep up with the times. Looks like that big hoagie we tried! Melissa it was a foam display on the service counter. It was huge!! The cook was laughing at us. My ex used to make sandwiches like that, he probably still does. They were enormous and caused considerable gas that I had to suffer through during the night, from him not me. Very cool. Will you making the live version soon? Looks like a fun trip. fun photo but I was disappointed to learn it was a foam prop. Dagwood use to crack me up with his humongous sandwiches and no way would I ever attempt one of them. Looks like you guys had a fun time. Joan - I wish I would have gotten the cook's expression looking across at Red. She almost lost it. It was really hilarious. I'm sure that would have taken away any disappointments! You can't get hungry for that kind of sandwich. Dagwood sandwiches that was the best! I can't wait to taste one. A funny photo but sometimes I want that this pic were real, especially when I'm starving!